BackgroundThe prevalence of diagnosed autism has increased rapidly over the last several decades among U.S. children. 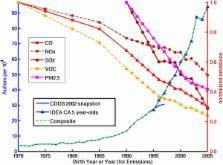 Environmental factors are thought to be driving this increase and a list of the top ten suspected environmental toxins was published recently.MethodsTemporal trends in autism for birth years 1970–2005 were derived from a combination of data from the California Department of Developmental Services (CDDS) and the United States Individuals with Disabilities Education Act (IDEA). Temporal trends in suspected toxins were derived from data compiled during an extensive literature survey. Toxin and autism trends were compared by visual inspection and computed correlation coefficients. Using IDEA data, autism prevalence vs. birth year trends were calculated independently from snapshots of data from the most recent annual report, and by tracking prevalence at a constant age over many years of reports. The ratio of the snapshot:tracking trend slopes was used to estimate the "real" fraction of the increase in autism.ResultsThe CDDS and IDEA data sets are qualitatively consistent in suggesting a strong increase in autism prevalence over recent decades. The quantitative comparison of IDEA snapshot and constant-age tracking trend slopes suggests that ~75-80% of the tracked increase in autism since 1988 is due to an actual increase in the disorder rather than to changing diagnostic criteria. Most of the suspected environmental toxins examined have flat or decreasing temporal trends that correlate poorly to the rise in autism. Some, including lead, organochlorine pesticides and vehicular emissions, have strongly decreasing trends. Among the suspected toxins surveyed, polybrominated diphenyl ethers, aluminum adjuvants, and the herbicide glyphosate have increasing trends that correlate positively to the rise in autism.ConclusionsDiagnosed autism prevalence has risen dramatically in the U.S over the last several decades and continued to trend upward as of birth year 2005. The increase is mainly real and has occurred mostly since the late 1980s. In contrast, children’s exposure to most of the top ten toxic compounds has remained flat or decreased over this same time frame. Environmental factors with increasing temporal trends can help suggest hypotheses for drivers of autism that merit further investigation.Electronic supplementary materialThe online version of this article (doi:10.1186/1476-069X-13-73) contains supplementary material, which is available to authorized users. Metabolic endotoxemia initiates obesity and insulin resistance. Diabetes and obesity are two metabolic diseases characterized by insulin resistance and a low-grade inflammation. Seeking an inflammatory factor causative of the onset of insulin resistance, obesity, and diabetes, we have identified bacterial lipopolysaccharide (LPS) as a triggering factor. We found that normal endotoxemia increased or decreased during the fed or fasted state, respectively, on a nutritional basis and that a 4-week high-fat diet chronically increased plasma LPS concentration two to three times, a threshold that we have defined as metabolic endotoxemia. Importantly, a high-fat diet increased the proportion of an LPS-containing microbiota in the gut. When metabolic endotoxemia was induced for 4 weeks in mice through continuous subcutaneous infusion of LPS, fasted glycemia and insulinemia and whole-body, liver, and adipose tissue weight gain were increased to a similar extent as in high-fat-fed mice. In addition, adipose tissue F4/80-positive cells and markers of inflammation, and liver triglyceride content, were increased. Furthermore, liver, but not whole-body, insulin resistance was detected in LPS-infused mice. CD14 mutant mice resisted most of the LPS and high-fat diet-induced features of metabolic diseases. This new finding demonstrates that metabolic endotoxemia dysregulates the inflammatory tone and triggers body weight gain and diabetes. We conclude that the LPS/CD14 system sets the tone of insulin sensitivity and the onset of diabetes and obesity. Lowering plasma LPS concentration could be a potent strategy for the control of metabolic diseases. Autism is considered the most heritable of neurodevelopmental disorders, mainly because of the large difference in concordance rates between monozygotic and dizygotic twins. To provide rigorous quantitative estimates of genetic heritability of autism and the effects of shared environment. Twin pairs with at least 1 twin with an autism spectrum disorder (ASD) born between 1987 and 2004 were identified through the California Department of Developmental Services. Structured diagnostic assessments (Autism Diagnostic Interview-Revised and Autism Diagnostic Observation Schedule) were completed on 192 twin pairs. Concordance rates were calculated and parametric models were fitted for 2 definitions, 1 narrow (strict autism) and 1 broad (ASD). For strict autism, probandwise concordance for male twins was 0.58 for 40 monozygotic pairs (95% confidence interval [CI], 0.42-0.74) and 0.21 for 31 dizygotic pairs (95% CI, 0.09-0.43); for female twins, the concordance was 0.60 for 7 monozygotic pairs (95% CI, 0.28-0.90) and 0.27 for 10 dizygotic pairs (95% CI, 0.09-0.69). For ASD, the probandwise concordance for male twins was 0.77 for 45 monozygotic pairs (95% CI, 0.65-0.86) and 0.31 for 45 dizygotic pairs (95% CI, 0.16-0.46); for female twins, the concordance was 0.50 for 9 monozygotic pairs (95% CI, 0.16-0.84) and 0.36 for 13 dizygotic pairs (95% CI, 0.11-0.60). A large proportion of the variance in liability can be explained by shared environmental factors (55%; 95% CI, 9%-81% for autism and 58%; 95% CI, 30%-80% for ASD) in addition to moderate genetic heritability (37%; 95% CI, 8%-84% for autism and 38%; 95% CI, 14%-67% for ASD). Susceptibility to ASD has moderate genetic heritability and a substantial shared twin environmental component. This article is published under license to BioMed Central Ltd. This is an Open Access article distributed under the terms of the Creative Commons Attribution License ( http://creativecommons.org/licenses/by/2.0), which permits unrestricted use, distribution, and reproduction in any medium, provided the original work is properly credited. The Creative Commons Public Domain Dedication waiver ( http://creativecommons.org/publicdomain/zero/1.0/) applies to the data made available in this article, unless otherwise stated. Recent anthropometric trends among Swedish school children: evidence for decreasing prevalence of overweight in girls.